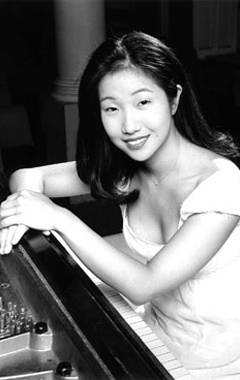 Montreal pianist Lucille Chung, has been acclaimed for her impassioned and refined performances, "combining vigour and suppleness with natural eloquence and elegance" (Le Soir, 1995). 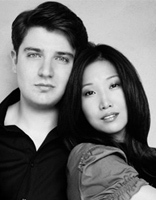 Lucille was the Korean Concert Society's 18th recitalist for her Washington area debut in September 1994 at the Terrace Theater. She made her debut at the age of ten with the Montreal Symphony Orchestra, and music director Charles Dutoit subsequently invited her to be a featured soloist during the orchestra's asian tour in 1989. Since then she has performed with numerous Canadian orchestras as well as several international ensembles, including the Moscow Virtuosi and the Philadelphia Orchestra. She has appeared with conductors such as Krzysztof Penderecki and Vladimir Spivakov. She has given recitals at the Kennedy Center in Washington, D.C., New York's Weill Hall at Carnegie Hall, the Concertgebouw in Amsterdam and Toronto's Ford Centre for the Performing Arts. Besides Canada and the United States, she has performed in Germany, Holland, Belgium, France, Italy, Spain, Austria, Hungary, Russia, Slovakia, Lithuania, Japan, Korea and Brazil. In 1989 she was the First Prize winner at the Stravinsky International Piano Competition. She won Second Prize at the 1992 Montreal International Music Competition, at which she also won a Special Prize. In 1993, she received the Outstanding Achievement Award from the Governor General of Canada and in 1994, she won the Second Prize at the First International Franz Liszt Competition in Weimar. The year 1998 was a fruitful one for Ms. Chung, as she was the winner of several international competitions in Italy, including the Pescara, Pinerolo and "Riviera del Conero". In 1999, she was awarded the prestigious Virginia Parker Prize by the Canada Council for the Arts. She graduated from the Curtis Institute of Music and the Juilliard School, where she worked with Seymour Lipkin. She also studied with Karl-Heinz Kammerling at the "Mozarteum" in Salzburg. In 1997, Lucille received the Konzertexam Diplom from the Hochschule fur Musik "Franz Liszt" Weimar, where she worked with Lazar Berman. She is presently at the Accademia Pianistica "Incontri col Maestro" Imola, Italy. Lucille Chung's recording of the Mendelssohn Concerti, released on the CBC/ Radio-Canada label, was nominated for a Prix Opus in 1998. She has also released a solo recording on the Palexa label. Furthermore, Lucille fluently speaks French, English, Italian, German, Korean and Russian.